The Graduate School of Excellence Materials Science in Mainz (MAINZ) has again awarded visiting professorships to three outstanding scientists. 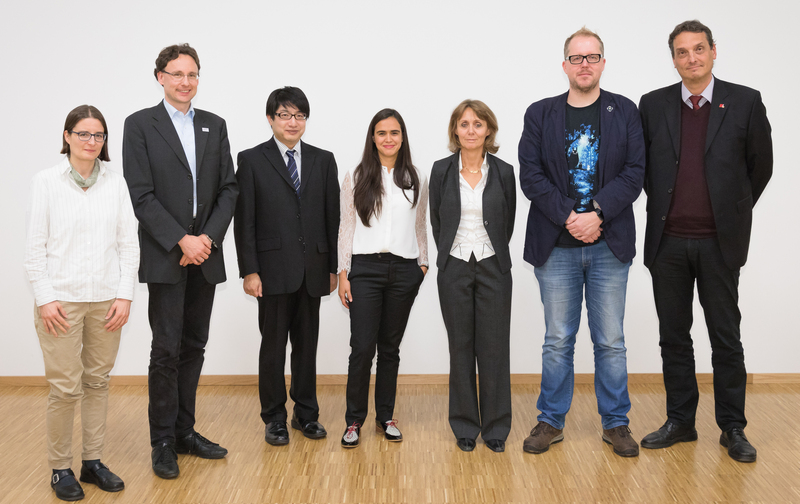 The MAINZ Visiting Professorships 2017 were presented at a gala event to Professor Adam Foster, a physicist of Aalto University, Helsinki, Finland, to Professor Eiji Saitoh, a physicist of Tohoku University, Sendai, Japan, and to Professor Roberta Sessoli, a chemist of Università di Firenze, Italy. Visiting professorships were established by MAINZ to attract foreign scientists to the various departments of the Graduate School so they can do part of their research here and work with the doctoral candidates studying at MAINZ. Their input can take the form of lectures, seminars, and workshops that help in training doctoral candidates at MAINZ. The visiting professorships have been awarded annually since 2013. Adam Foster is a theoretical physicist working in the field of surface and interfacial science. Already during his time as PhD student at University College London, he contributed substantially to understanding the role of defects in bulk oxide materials. His research has attracted numerous citations, and he is author of pivotal review articles, addressing defects in wide band gap as well as high-k materials. He his tenured professor at Aalto University where he is heading the "Surface and Interfaces at the Nanoscale" simulation group and director of the Aalto Education Network in Condensed Matter Physics. His dedication to graduate education is reflected in unconventional teaching and meeting formats and an open discussion culture. Eiji Saitoh is a pioneer of spin-current physics. By discovering many major phenomena in the field, such as the inverse spin Hall effect (ISHE) and the spin Seebeck effect (SSE), he forged the foundations of spin-current science and what is now called spin-caloritronics. Eiji Saitoh is committed to dissemination activities of spin current science: together with his colleagues he published one of the standard text books in the field of spin current science: "Spin current" (Oxford university press). Amongst many other awards, he has been chosen by the IEEE Magnetic Society to be the 2017 Distinguished Lecturer to give outreach talks highlighting the high quality of his presentations. Roberta Sessoli is a pioneer in the field of molecular magnetism. Her research work on low dimensional molecular materials led to the breakthrough discovery that a few paramagnetic metal ions in a molecule can behave like a magnet. An ERC Advanced Grant allowed her to establish a new research team working at the interface between surface science and molecular magnetism. Roberta Sessoli was appointed a member of the Science and Technology Advisory Council created in 2012 by the President of the European Commission. In that function, she has contributed to the drafting of documents about science for an informed, sustainable and inclusive knowledge society and about science for the future of Europe.